Nike Basketball officially welcomes back Kevin Durant with an exclusive Nike KD 9 Elite Golden State Warriors PE just-in-time for the NBA Playoffs. The latest Nike KD 9 Elite comes dressed in an all-Blue upper with Gold accents throughout the Flyknit upper, Nike Swoosh and KD logo as well as the Air Zoom midsole. It’s rubber outsole is fully dressed in Blue. 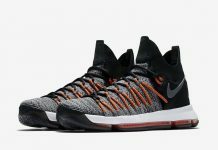 Check out the additional images below and let us know what you guys think of this Nike KD 9 Elite PE in the comments section.